Formerly known as ATI, AMD's graphics division has had a good run of late, culminating with the Radeon 5000-series launch last year. Keeping radio silence for much of 2010, the Austin outfit has now brought the mid-range Radeon 6000 series to bear with the Barts-based HD 6870 and HD 6850 GPUs. While improving on key metrics such as performance-per-watt and performance-per-buck, the enthusiast has been left hanging on to the end of the year for the genuinely high-end Radeon HD 6970 and HD 6950 GPUs - codenamed Cayman. In this review we shall refer to the general architecture as Cayman and the specific GPUs by their shipping names of Radeon HD 6970 and Radeon HD 6950. Now, though, the wait for these single-GPU Cayman-based cards is over. 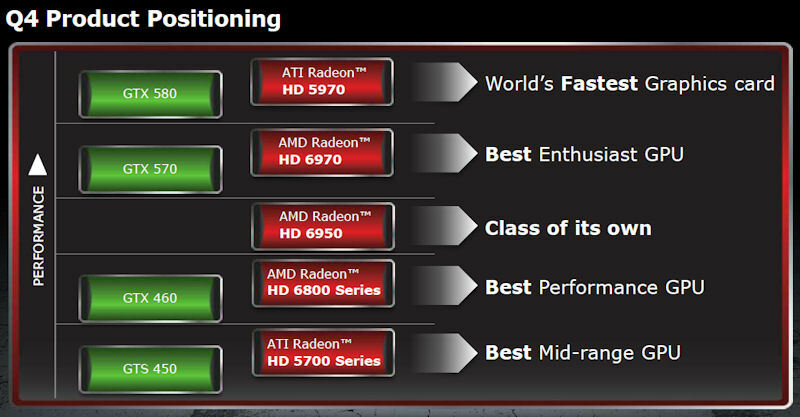 AMD has its ducks in a row and is ready to wreak havoc to NVIDIA's GeForce GTX 580 and GTX 570 GPUs and lay the smackdown once again, just as it did with the Radeon HD 5870 last year. Erm, it's not, actually. 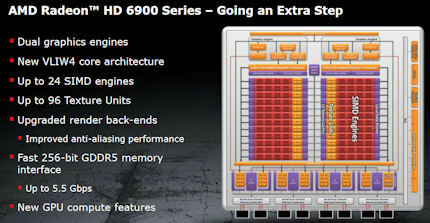 Here is a product positioning stack slide from AMD's press presentation. What's abundantly clear here is that the two new Radeon GPUs - HD 6970 and HD 6950, remember - will sandwich the recently-released GeForce GTX 570, which is the second-rung card in NVIDIA's enthusiast line-up. 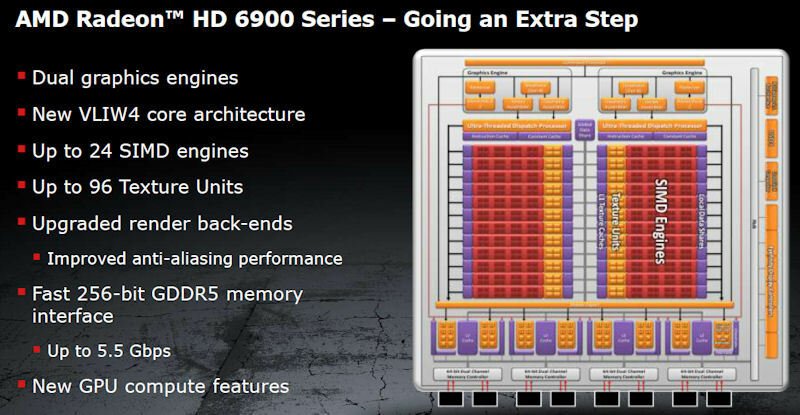 Going by this slide, please don't ask us to explain how AMD can justify its model-numbering system. Radeon HD 5970 sits above HD 6970. Go figure. We're frankly surprised that AMD is openly declaring it's not going to topple the GeForce GTX 580 with a new Radeon architecture in 2010. Being bereft of single-GPU leadership means that NVIDIA, not AMD, defines the market price in the high-end segment of the graphics-card market. Not having control over the market means AMD has to slip the two new Radeon cards in at lower price points than it would otherwise charge. Our latest information is that the Radeon HD 6970 will come in at around £299, including VAT, while the Radeon HD 6950 will ship from £225. The fact that AMD is conceding single-GPU leadership this year is telling. 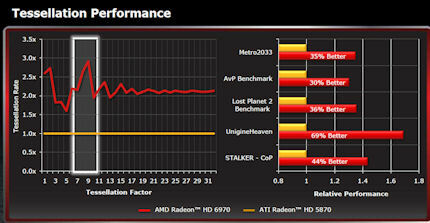 Cast your minds back 12 months and the superb Radeon HD 5870 demolished NVIDIA's single-GPU GeForce GTX 285 card. Indeed, it took the twin-GPU GTX 295 to beat out AMD's finest. The roles have been reversed, perfectly, in Q4 2010, it would seem: the ebb and flow of GPU manufacturing, eh? But will performance-limited Cayman provide a solid base for AMD to build on for the next 12-18 months? Only one way to find out. 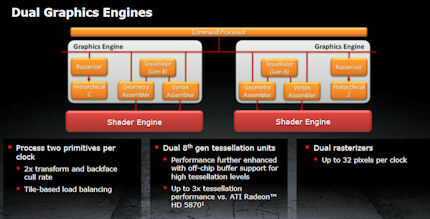 So with the bombshell that AMD's high-end Radeons will be hemmed-in by the new GeForce GPUs, at least until the twin-GPU Radeon HD 6990 - codenamed Antilles - hits the shelves in Q1 2011, let's trot out the block diagram. The high-level overview shows the Cayman GPU in full-fat Radeon HD 6970 flavour. 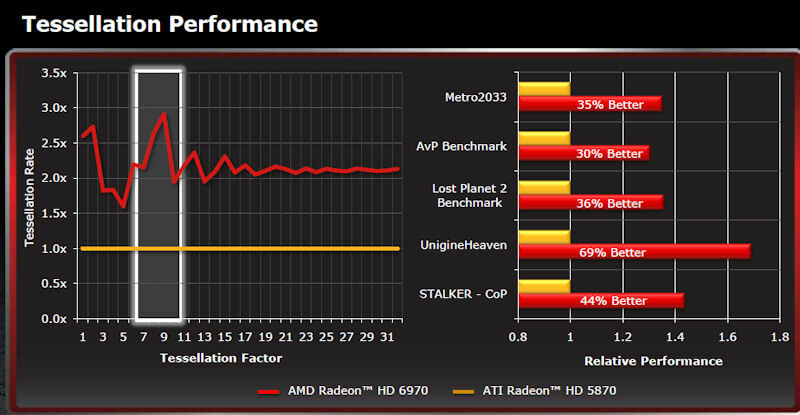 The HD 6950 is based on exactly the same architecture, albeit with fewer shaders and lower frequencies. First off, Cayman is an evolutionary step from the Cypress GPU that powers the Radeon HD 5800-series family. It is manufactured on the same 40nm process at TSMC and, like Cypress, is fully DX11-compliant.The general setup of the GPU is also the same, but AMD has made some important design changes that provide clues to how it sees the GPU workload changing in the near future. Cayman, too, is different from the Barts-based Radeon HD 6870/50 GPUs released recently, which can be considered a tweaked version of Cypress. Getting bored of codenames yet? Taking it from the top and zooming into the setup and geometry-processing section, Cayman now has two genuine graphics engines that feed the ALUs. You may remember that the Barts GPUs appear to have two distinct geometry setups spanning the GPU, but they lack the hardware required to process more than one primitive (triangle) in a single clock cycle. Cayman, on the other hand, can literally double the throughput heading into the processing cores. This doubling extends to the tessellation units - identical to Barts' - and the net result is Cayman feeds the instruction-munching cores in much better fashion than Cypress. This increased geometry/tessellation throughput goes hand-in-hand with the way that newer games engines are designed. AMD reckons that Radeon HD 6970's tessellation performance is, on average, 2x that of Radeon HD 5870 - down to the doubling of the tessellation units and greater efficiency of the 8th generation engine. As newer games use tessellation and increased geometry, this advancement can push up perf by a healthy margin. Bear in mind that older titles won't see anywhere near as large an improvement, though. It doesn't pass us by that one of NVIDIA's chief advances in its Fermi GPUs is the significant boosting of the geometry throughput.